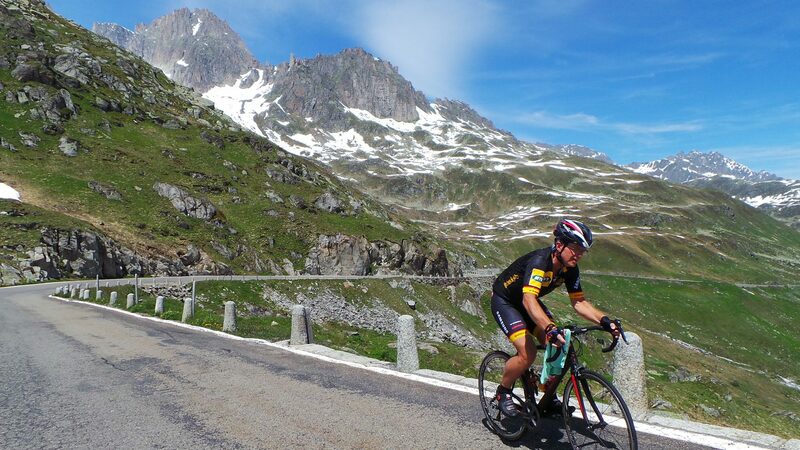 Around 11 we arrived in Airolo – I had a snack, changed into my cycling gear and set off to tackle the Gotthard over the famous cobblestone section, the Via Tremola. At an average of 7.3% it’s not an easy climb, but it’s steady as far as the grades are concerned. Riding the cobblestones turned out to be more problematic than I anticipated. The dynamics / kinetics of riding cobblestones are not a new phenomena to me and I’ve never been fond of them. But the Via Tremola – roughly the section between kilometer 8 and 12 – is (very) special in its own right and the views are fantastic, so I bounced up enjoying those very much. At the summit, I decided to go on immediately after taking some pictures, also because there was not much to do there, except visit the museum perhaps. The first downhill section was over cobblestones as well, so not very fast – I could have taken the main road from the summit too, but I now joined this after some 3 kilometers, for the final stretch into Hospental. 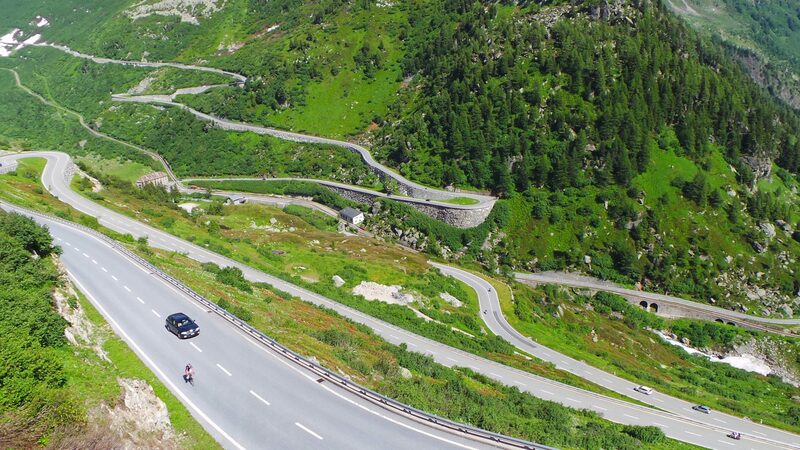 I then rode over the near flat Furkastrasse towards Realp, were the actual climb of the Furka pass starts. This one turned out to be a little harder than I expected. All three passes I planned for today were around 12 kilometers and the profiles were pretty similar. However, the seemingly endless, near straight towards the summit, where the headwind was strong, took a great deal of my reserves. So, luckily the restaurant “Furka Blick” just before the summit was open for business. The spectacular descent into Gletsch offered a good view on the coming Grimsel too and I was seriously considering not to descend onward to Oberwald, but decided to do so anyway. Once there, I returned towards Gletsch and during these 6+ kilometers, the headwind was so strong, it left me breath- and powerless again, which made me regret having taken that decision. Once in Gletsch, I just settled into a pace I hoped I could maintain – every right hairpin turn would bring me headwind, but I could recover a bit after every left hairpin turn. The views also helped me get up there, as these were pretty spectacular being able to view both the Furka and the Grimsel most of the way up. At the summit, we had a short break for a coffee, I scored a souvenir in the only souvenir shop we saw today and started the descend to Inertkirchen. 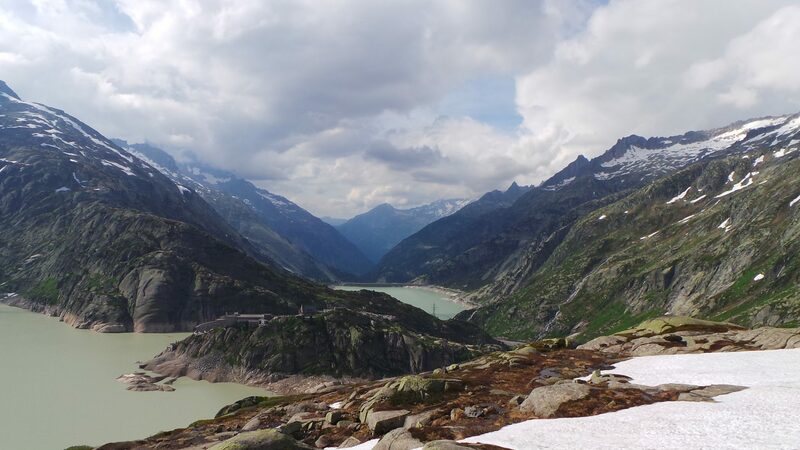 Having enjoyed the views going up, the views down turned out to be the most breathtaking I have seen in the past two weeks, especially in the top half of the descend, past the Grimsel- and Räterichsbodensee. The view on the Grimsel Hospiz looked like a scene from Lord of the Rings and I was somehow so touched by it, that I just wanted to sit down there and enjoy it as long as I could. Perhaps the fact that this descend was the final stretch of this Giro d’Italia made me more receptive too, I don’t know, but as we still had some hours to drive to our stopover for the night, I had to continue the flying descend. Just stunning!! What an amazing trip. And if you said it was a headwind I know it must have been brutal! !